As a Liable Party under the National Television and Computer Recycling Scheme (NTCRS), you will need to carefully weigh up which of the approved Co-regulatory Arrangements you select to meet your organisation’s obligations. The NTCRS is a Scheme under the Product Stewardship Act 2011, which legislates that government, industry and the community have a shared responsibility to reduce waste, increase recycling and manage the environmental, health and safety impacts of the products that we use. The NTCRS identifies manufacturers/importers of covered products who import over set thresholds as liable to fund the recycling of end-of-life products by joining and funding a Co-regulatory Arrangement to meet set scheme outcomes. ANZRP works for its members, not for profit, providing a lean and sustainable arrangement to meet their liability under legislation, and ensuring Australian households and businesses have a free and easy way to responsibly dispose of and recycle their e-waste. We are committed to setting the highest standard of recycling, and have recovered at least 90% of the materials that products are made from through our recycling of Scheme products we collect each year since the Scheme’s inception. 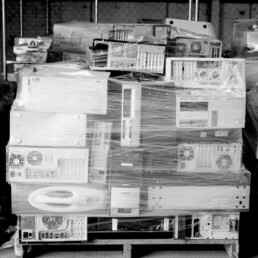 We only partner with recyclers who operate to sound environmental and workplace health and safety standards and 100% of e-waste we collect is recycled in Australia (at least first stage processing). Key industry representatives are on our Board of Directors, so you can rest assured your brand will be safeguarded, and you are partnering with the NTCRS’ leading Co-regulatory Arrangement. If you have received a letter from the Department of the Environment and Energy, advising you of your commitments under the Product Stewardship (Televisions and Computers) Regulations 2011, contact us on (03) 9020 2222 or email enquiries@anzrp.com.au and we will guide and support you through the next steps.